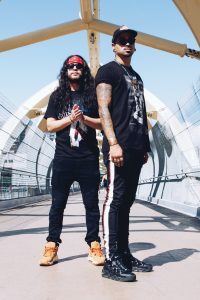 Snotty Nose Rez Kids are a hip-hop duo from the Haisla Nation of the Haislakala speaking people.Recreating their identities within their own contexts, they aim to reclaim their voices and share them with a wider audience. Zazaxsmalis, otherwise known as Yung Trybez is a writer, rapper, photographer and spoken word artist of “The People of the Snow” that is the Haisla Nation. Wa’tla’ka othethise known as Young D or “D” is a songwriter/rapper that was born and raised in Kitamaat Village. Together they are the Snotty Nose Rez Kids. Their S/T debut album was released in 2017 and in Summer 2017 they released their new mixtape, The Average Savage.